bg/ish: "These Are Not The Beers You Are Looking For"
Over at Mission Mission, they got a pretty cool snapshot of this local Jedi questioning the cops for making people pour out their beers at Dolores Park. Dolores Park is pretty much my backyard. Literally. I'm right on the corner of 18th and Church. I was in the park that day, although I didn't see the SFPD making people pour out beer, I did come across this particular Jedi fellow. If I recall he had a Doberman named Mary Jane. Her and Chewie played for a bit. I love how he's holding a lightsaber. 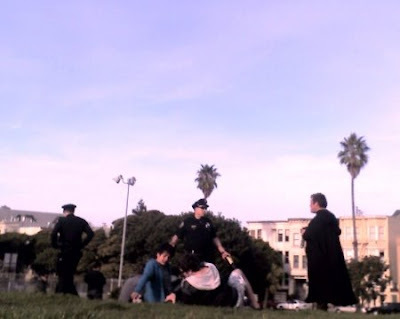 Why are the cops rolling people for drinking beer in Dolores Park? Lots of locals hit the park on nice days (or any day for that matter) to chill out and have a beer after work, or before work, or just because. I'm there at least 3 times a day with my dog, and I can tell you that what these cops were doing is absolutely unnecessary. I see crack deals in broad daylight no less than 4 blocks from this park! So far during my time here in SF I've had no reason to have anything other than respect for the police. But lately I've had a couple mild run-ins I've considered to be foolish, and I've seen some pretty harmless people getting rolled and hassled for minor, if not petty offenses. Note to SFPD: You may have thrown a wrench into a few relaxed and well meaning peoples plans the other day, but beyond that you've accomplished nothing. Why decide to hit DP at all? Did a resident call to complain? Was there violence? No. My guess is boredom. I hope this doesn't become a trend. I'm looking forward to a brilliant summer by the park. I don't want to be hassled in my neighborhood by a few cops who's intentions cannot even be classified as "well meaning". the only thing i didn't like about that park were the buttcracks. i saw so many.